LeapFrog products have been in our house since we started having babies! We’ve had a Violet, maps, the reader and we even reviewed the original LeapPad (wayyyy back in 2011). We have been very pleased with them. 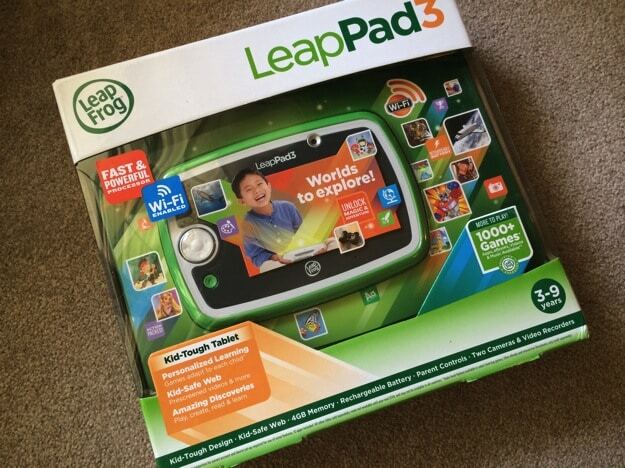 We were recently sent a LeapFrog LeapPad3™. The girls saw the box and immediately wanted to play with it, but I made them wait so we could charge it up. Once it was charged up, it resulted in hours of fun before having to plugin it back in. 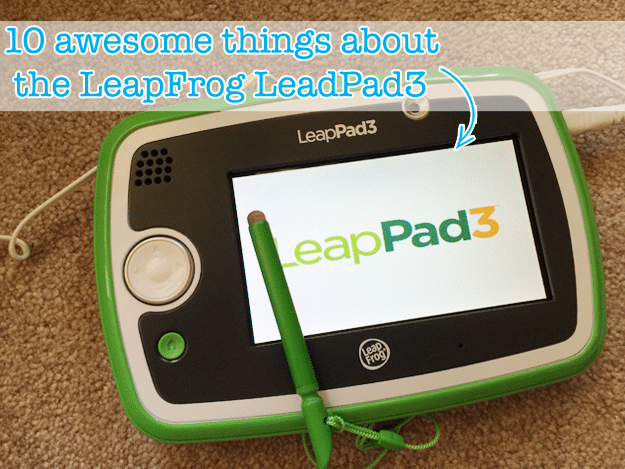 We’ve compiled a list of 10 awesome things about the LeapFrog LeapPad3! It comes with a USB rechargeable battery, USB Cord and AC Adapter. No more sucking down all of the AA batteries. And, that battery lasts for quite a while. We’ll be good on the road, too because we have an outlet in the car! It comes preloaded with 10 apps like Photo Fun Ultra (which your kids will use to take silly pictures and make them sillier), Pet Pad Party and more. You get a choice of one free app download that you or your children can pick. We picked a logic app that has the kids make a path for a little critter. It has a ton of levels and is challenging even for the 7 year old. It has 4GB memory built in. That’s a lot of pictures and drawing that can be stored. My kids love taking pictures of themselves and each other. This also means you can buy a lot of apps and store them on the device. Parent controls. I can log in and decide which of the kids accounts if any are able to have Wi-Fi as well as set the ability levels. Super responsive stylus. As I was setting the account up, I was amazed at how accurate the stylus was at getting the right letter for email addresses, names and more. I really like the soft tip, too. Built-in Wi-Fi with LeapSearch powered by Zui. It allows the kiddos to search around and explore kid-friendly web content that is 100% pre-screened and approved by learning experts. My favorites were the YouTube videos showing science experiments and the animal videos. Skill levels are automatically adjusted on certain apps. 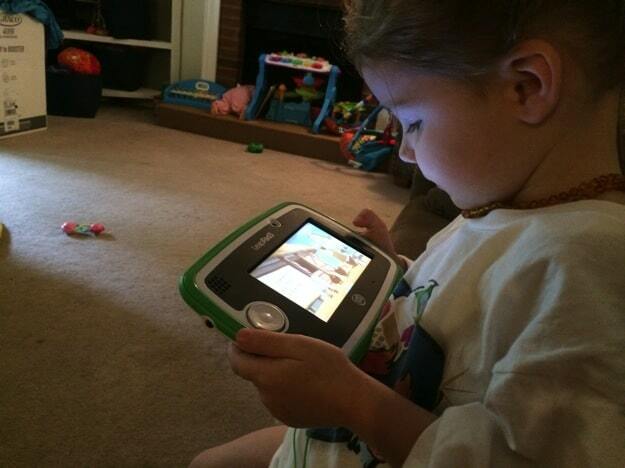 The LeapPad3™ learns from the kids and adjusts so they get the best experience. This kind of reminds me of when I was studying for and taking the GRE. Two cameras, front and rear. The girls love taking pictures of themselves and their sisters to set up their accounts and have them interact within the apps. The cameras aren’t HD or super fabulous resolution, but the kids love them. Access to 1000+ educator-approved games, apps, eBooks, videos and more. I can decide which apps to purchase based on what my kids’ levels and interests are so that they get the most use out of them. We had purchased a Cinderella app on our previous LeapPad and it synced right up with our new one. The LeapPad3 has been a great addition for our girls to have a safe place they can play and have fun. We’ve put together a video of some of our favorite features, with the girls included! Check out what they think! You can buy the LeapPad3 on Amazon and if you have prime, get it in two days! What new technology are your kids enjoying at your house? These LeapPads are really cute, I wish they would have had something like this whenever my kids were younger. 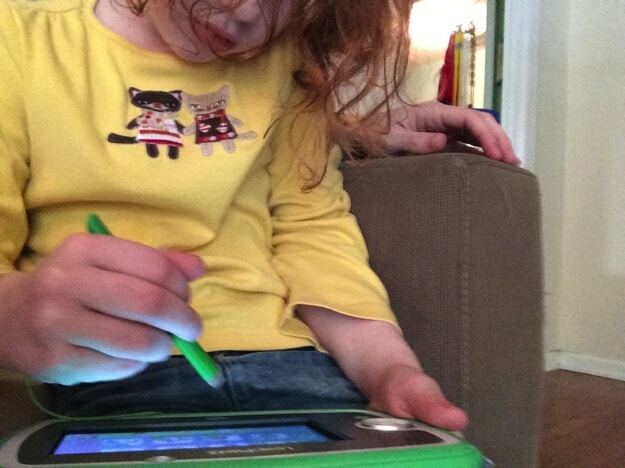 My son has the Leap Pad 2 and loves it, but gosh, it eats batteries! It’s nice that this one comes with a rechargeable battery. He is also really into my iPad these days too. I’ve been a fan of the LeapPad since the original too and love the LeapPad 3 for all of the reasons you listed! I’m sad that at ages 10 1/2 and 8, my kids seem to have aged out of the content for regular use but still loved helping me test our review unit when it arrived! Sounds like a great tech product for the kids. I’ve never used any of the Leapfrog products. We went straight to the iPad and other tablets for the kids. We had a LeapPad when A.J. was a toddler that I gave to someone else. Now we have two other kids tablets he enjoys. The safety settings and parental controls are my favorite features! Awesome! We have the Leap Pad 2 right now and are looking into the Leap Bands for Christmas. We have all the others, including Violet so it only seems right! We don’t have the leap pad 3 (I don’t think), but we have some other models around the house. I love these gadgets for in the car and on the go. Owen just recently rediscovered one of ours and has been super happy once we put the new batteries in! We too are huge LeapFrog fans in this house! I love that there are parental controls and educator approved games! Can’t wait to check this one out! The LeadPad3 looks great! I look forward to when Brian gets a little older and can enjoy things like this! My six year old asked for one the other day. He has his own tablet but he wants one of these. I could have went cheaper.